"An impressive site. I've forwarded the address to all at Total Football." 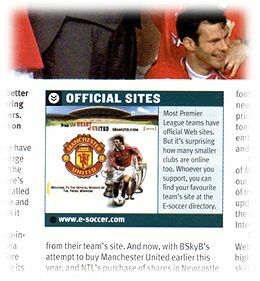 Article from Internet Magazine on the best Internet football sites, highlighting e-soccer as the recognised 'official' directory of English soccer. Article from FourFourTwo magazine on English Internet football sites recommending e-soccer as the search engine to use.